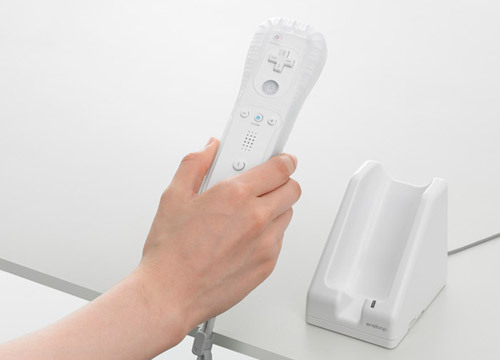 The new ‘Wii Remote Control” Contactless Charger Set for the Wii Remote Control’ goes on sale in Japan on August 25 and comes with a surprise that the name more or less gives away – wire-free recharging (of a sort). The replacement battery pack – naturally, it uses eneloop cells – draws its power not through metal contacts in the cradle, but by magnetic induction similar to that used by Splashpower and others. Obviously, this means there’s no need to remove the Wii’s silicone jacket just for recharging. Any obstructions between the cradle and the Wiimote, such as coins or paperclips, automatically stop charging as a safety precaution. As for pricing, the base set costs ¥5,500 ($50) and includes a battery pack, an AC adapter and a single stand. Sanyo says that four sets can be linked together, although this will cost around ¥20,500 ($190) for all the bits needed.